No Red Seas. When good came from evil. 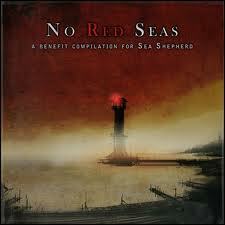 No Red Seas is to quote it’s blurb a “compilation album raising funds for Sea Shepherd to stop the mass killing of dolphins and whales and protect marine life”. It also has the added bonus of upsetting some Norwegians, so can only be seen as a power for good. What is more surprising is that this fine attempt was the result of Sol Invictus tub thumper and video nasty “artist”, Lesley Malone, a diminutive Rosa Kleb like phenomena whose evil empire is run from a camouflaged shed in battle ravaged Peckham. To find that this wholesome and life affirming endeavour sprung from such as this is like discovering that Evola would sneak off and work in a soup kitchen when not swotting for his SS O level or Goldman Sachs secretly gives all its profits to the Hillside Animal Sanctuary. In the end what matters is that Flipper can continue to kop a feel off pretty, naive marine biologists without the interference of meddlesome interbred Nordics. So please give generously. Upsetting Norwegians? Can only speak for myself, here (the other are to busy chewing on singing lard), but I see this as the perfect colaboration. We kill whales, you guys make great compilations of music for us to listen to while we eat them. You sir are worse then Hitler. He at least was not Norwegian. Ah, well, if he’d been Norwegian, he’d kill all the lard, not just the jewish ones. If he had been Norwegian he would have had to surrender to himself.